When launching this website I had several reasons for believing there would be enough Irish whiskey news to report on. Jameson had become one of the leading global spirit brands, and would doubtless drag the Irish whiskey category along behind it. Cooley had been distilling continuously for enough years that it could finally put out some great matured malts. And Diageo had recently taken over Bushmills. Pernod Ricard, IDL's parent, chose to put most of its efforts into promoting Jameson, leaving the other brands, like Bushmills, ticking over. In 2005, in one of those typically complicated multinational drinks deals, Pernod sold Bushmills to Diageo. Suddenly the game was on. Diageo was new to Irish whiskey but could draw upon substantial experience in Scotch manufacture. Of course it also had the distribution and marketing muscle to challenge Pernod globally in the formerly uncontested category of Irish whiskey. Since then Diageo has poured cash into Bushmills. The equipment is being refurbished and expanded. The distillery now operates seven days a week, up from three. They expect to double output over the next five years. Of course we have yet to see the fruits of this investment since whiskey takes many years to mature and Diageo has only been running the show for three. But it's a time of renewed vigour for the Co. Antrim distillery and so it's apt that a new book on the company has just been published. 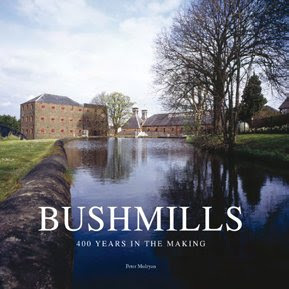 The excuse for releasing Bushmills: Four Hundred Years in the Making is the 400th anniversary of the first official license to distil granted to the Bushmills area. But it couldn't come at a better moment as the stills work overtime and the company readies for an epic battle with Jameson. The author, Peter Mulryan, was commissioned by Bushmills to create this commemoration of a distinguished history. This echoes the genesis of the last book on the distillery, Spirit of the Age: Story of Old Bushmills , published a generation ago. Then, on the 375th anniversary, Alf McCreary was asked by the managing director to record the oral history of the workers, many retired, who knew the distillery intimately. McCreary's book is a valuable reference, full of anecdotes and personal sketches of the locality and the characters associated with the distillery. It is also thick with facts and figures, meticulously sourced and annotated. The new book covers much of the same ground but Mulryan has stripped out the fog of detail and personal reminiscences to fashion a tight and coherent narrative while omitting nothing of importance. This is no mean feat. Bushmills has been buffeted by many forces, political and economic. As if the story does not have enough twists and turns to follow, the researcher is also confounded by the destruction of distillery records on two occasions - in 1885, when the distillery burned to the ground; and again in 1941, courtesy of the Luftwaffe. Some basic facts are, as a result, unknowable. For example, why did Bushmills switch, in the late 19th century, to manufacturing malt whiskey, a style not associated with Ireland? Mulryan firmly places Bushmills in the context of its times. The book describes the effects of two world wars, the temperance movement, Prohibition, the partition of Ireland and the subsequent "Troubles". He also tracks the company in and out of bankrupty, through the hands of numerous owners and laments the many lost business opportunities, not only for Bushmills, but for Irish whiskey in general. The marketing missteps of the twentieth century eventually resulted in the consolidation of ownership of all Irish whiskey brands under the umbrella of Irish Distillers. Happily for the Bushmills factory, it escaped the fate of the other handful of Irish distilleries still operating in the late 1960s. They all fell silent, their output replicated in a shiny new industrial facility in Midleton, Co. Cork. It's a complicated tale but Bushmills: Four Hundred Years in the Making divides it up into many short, digestible chapters. The story of Bushmills is really the story of Irish whiskey and this book would be an excellent introduction to that topic. In fact, I cannot think of any other book currently in print that covers the subject in as much detail. The book is generously illustrated with old advertisements and photographs of the distillery in operation through the years. It is beautifully produced; the only shame is that it did not receive a final proofing to eliminate the remaining typos. Of course, I cannot end without mentioning the spirit itself. Peter Mulryan is a noted whiskey writer and he provides plenty of delicious detail for the whiskey anorak, for example the name of the particular bodega in Jerez that Bushmills sources its sherry casks from. There is also a chapter at the end of the book devoted to the making of whiskey and a guide to the individual bottlings that Bushmills produces. Bushmills has had an eventful history. But I suspect, with its new management, that it might be entering its most interesting phase yet.